A SpaceX Falcon 9 rocket carrying the SES-9 communications satellite is seen atop Space Launch Complex 40 at the Cape Canaveral Air Force Station in this file photo. On May 31, 2018, SpaceX delayed the launch of Falcon 9 carrying the SES-12 satellite to no earlier than June 4, 2018. 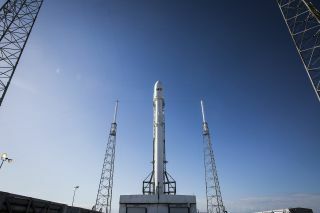 SpaceX has called off its planned launch of a commercial communications satellite on a Falcon 9 rocket on Friday (June 1), citing the need for extra tests on the booster's upper stage. A previously flown Falcon 9 rocket was scheduled to launch the SES-12 satellite into orbit from SpaceX's pad at Cape Canaveral Air Force Station in Florida Friday at 12:29 a.m. EDT (0429 GMT). But the mission will now launch no earlier than Monday, June 4, SpaceX representatives said. SpaceX initially aimed to launch the SES-12 satellite today (May 31). But on Sunday, the company announced a one-day slip to Friday. At the time, SpaceX said its launch team was "using [the] additional time to perform pre-launch vehicle checks, also closely watching weather conditions at the Cape." SpaceX fired up the nine engines on the Falcon 9 rocket's first stage last week during a static fire test on May 24. The Falcon 9's first stage was last used in September 2017, when it launched the robotic X-37B space plane for the U.S. Air Force and then landed successfully. The booster is an older "Block 4" model. (SpaceX's newest variant, the "Block 5," debuted this month) and is not expected to make a landing after the SES-12 mission. The SES-12 satellite was built by Airbus Defence and Space for the Luxembourg-based telecom company SES. The satellite is designed to provide direct-to-home video and data services to SES customers across the Asia-Pacific region, according to a mission profile. SES-12 is destined for a geostationary orbit 22,300 miles (35,900 kilometers) above Earth. It will replace SES' older NSS-6 satellite, according to an SES description.